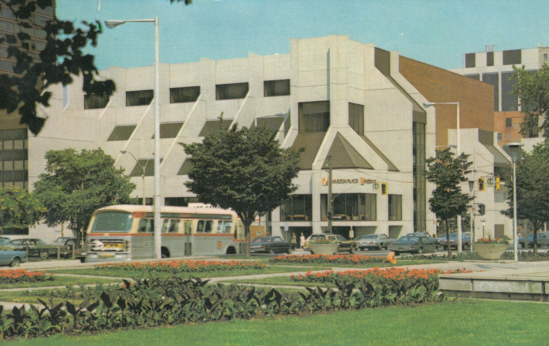 Theatre and concert hall, opened 1973. Also known as "Ronald V. Joyce Centre for the Performing Arts at Hamilton Place" after a sponsor. 2017 renamed "FirstOntario Concert Hall" after a corporate sponsor. Used for drama, opera and dance performances and for various shows and concerts. Home to the Hamilton Philharmonic Orchestra. Reverse Text: "Hamilton Place. Hamilton Place is one of Canada's newest and most sophisticated municipal theatre centres. Located opposite City Hall, the complex includes the 2,183-seat Great Hall with both concert an proscenium stages; the Studio Theatre with portable seating for up to 400 (adaptable for conferences and meetings); plus five meeting rooms with flexible seating for up to 100 each."